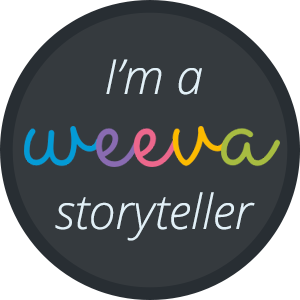 Weeva is a collaborative storytelling platform – a place where people come together to tell stories and share memories where everyone can contribute their own perspective. Weeva can be used in countless different ways – from collecting family history to supporting a friend who is critically ill – yet the core experience is the same: friends and family telling stories, together. The best part of Weeva are the books. Their online services make writing fun and storytelling with others easy, and when all the stories have been collected Weeva creates a unique, beautiful book full of all the wonderful things everyone contributed. Creating a Tapestry is simple. What is a Tapestry? A Tapestry is what they call a collection of related stories (that is, Threads). Tapestries are usually private, and invite-only. So to see what's in a Weeva Tapestry and to be able to add to it you must be invited by someone who is already a member of that Tapestry. My theme will be a Keepsake Book for my Daughter's! Signing up for a Weeva account is simple. Sign up for a Free Weeva account. After, a great first step is to fill out your profile. Clicking on "Menu" in the upper right and selecting "Edit My Profile" will allow you to add a profile picture and set some basic information. Having a complete profile helps others know who you are so they can better understand the stories and comments you add. Please Stay Tuned as I create this beautiful one of a kind Keepsake Book for my Daughter's. What an awesome idea! I can't wait to see how your keepsake book turns out! What a neat idea. I have never heard of Weeva before I will check it out. I´m a storyteller so that title intrigued me. I will check Weeva out! That's such a cool idea. I love that the entire family can get on it. It adds an extra dimension to those memories that you want to save forever. Wow this sounds like a really neat idea! I will check weeva out it sounds really interesting! Might have heard about it before, I think :) Anyway, it sounds like a wonderful idea, and your projects looks so much fun! The best part of this is the fact that others can get in on the memory making. The interesting thing about any event is that our memories are uniquely colored by our own feelings. As more people add in their pictures and anecdotes, the actual event starts to take shape. I've never seen anything like this before! Thanks for sharing so I can check it out. This sounds like an interesting idea. The lingo sounds little confusing though. i bet yours will be beautiful! have fun making it! Cool! I've never hear of this before but it sounds great! Wow, this sounds amazing!! I'm going to check it out! I'll definitely have to check out this site. I love the concept! I would love to create a tapestry, it sounds like such a unique process. This sounds so neat! I'll have to tell my friends & family about it. Maybe we could make a Tapestry of some sorts & then get a book of it. Sounds like a fun and cool program. I like the idea of a keepsake for your daughter. How sweet! I am wanting to make one of these for my dad! They sound awesome! This sounds pretty neat. Can't wait to see your next post about it. Interesting idea.... like an extension of personal blogging with a more social networking aspect. Weeva sounds like a very cool platform. I love reading stories that others have to share. This sounds amazing and it is such a great beautiful idea. I love how you are making it a keepsake for your daughter so she can look at the book years from now. Thanks for sharing. Sounds pretty cool. I can’t wait to see your creation. I'm not sure if my comment went thru but if not here it is again. I also love doing this kind of hobby before but now I'm so busy with blogging. I hope I can do this kind of artwork using the program.